Looking for ways to encourage student interest in science? These authoritative sites arm teachers not only with free multimedia, projects, and other deep resources, but also lesson plans and standards-aligned, curriculum-focused materials that will help you make the most of these educational and entertaining tools. 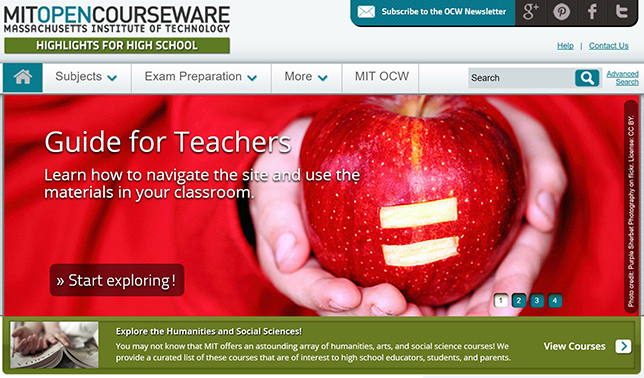 MIT's OpenCourseWare for Secondary Education (OCW SE), also known as Highlights for High School, is the first attempt on MIT's part to bring OCW to secondary education and the first step in a broader plan for secondary education that has been in development since 2006. Targeted specifically for schools, the resource provides 15,000 lecture notes; 1,800 syllabi; 2,600 videos, audio clips, and animations taken from actual MIT courses; 9,000 assignments; and 900 assessments. MIT's broader OpenCourseWare initiative is also available to students of all ages, though it's focused on post-secondary students. See sidebar for more information on MIT courses online, including the incredible SLS Lecture Browser from CSAIL. NASA Education provides a wide range of science resources online--some for students, some for educators, and some for people who just think space science is cool. 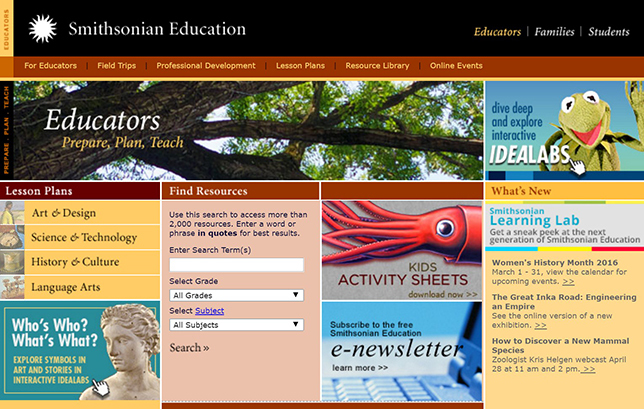 Its educator site provides resources by grade level, including videos, animations, simulations, educational opportunities, and links to relevant sites. For students, the site also provides a wealth of educational resources, as well as games, trivia, social features, a searchable subject database, career opportunities and profiles, and even a picture dictionary for younger audience members. NASA's online materials also go well beyond the classroom, with information about near-Earth objects, a Solar System Simulator, planetary surface maps, and news on the latest space missions. Check out the Jet Propulsion Laboratory site for more. 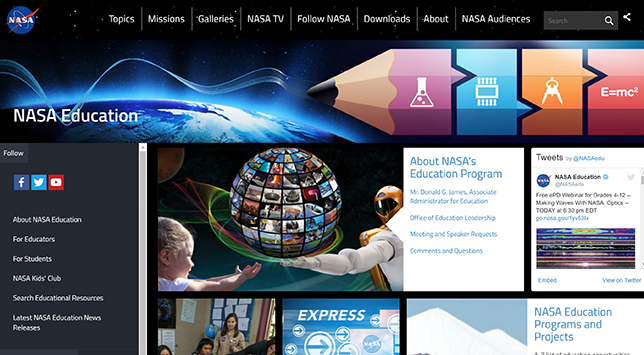 NASA Quest also provides grade-based online materials focused on project-based learning. The Smithsonian Institution's Smithsonian Education site, in addition to offering a vast repository of browsable historical materials, also provides teacher-focused resources geared toward the real-world requirements of public science education, including materials aligned to state and national standards. Its standards-aligned materials are searchable by state (or nation), grade, and subject area, and its general resources--more than 1,300 strong--can be browsed by specific subjects within science, such as air and space, Earth science, general science, etc. Of course, it also includes resources on a wide variety of subjects outside STEM subjects, including art, literature, and language arts.